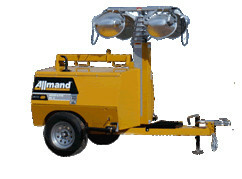 Light Tower Rental – Allmand ML EX V-Series, is available for rent in Rochester NY, Ithaca NY and the entire Western New York region from the Duke Company. Equipped with four, 1,250 Watt lights, the Allmand ML 15/20 V-Series light towers offer heavy-duty, reliable lighting for a wide range of settings. The tower is hydraulically activated to 25 feet, 6 inches in six sections. The lighting consists of 4-1250 watt, metal halide SHO-HD bulbs which generate 150,000 lumens per lamp.